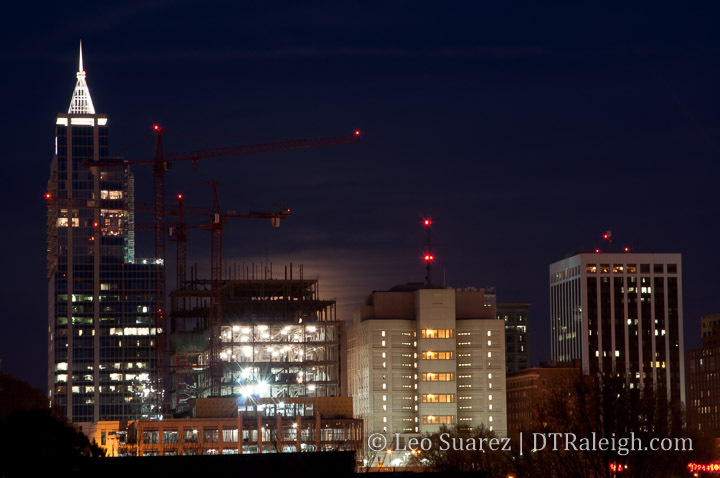 Raleigh Skyline during the supermoon on March 19, 2011. 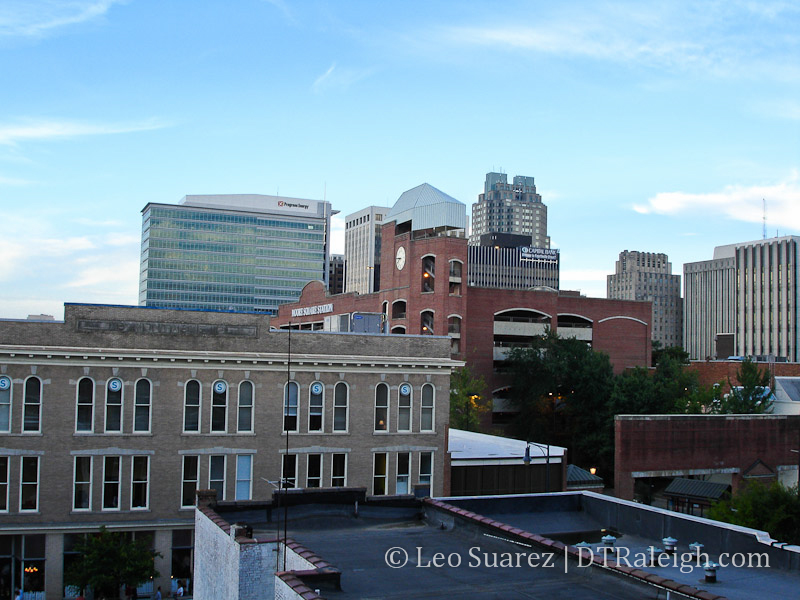 Today marks 12 years of downtown Raleigh geeking, blogging, conversations, and meetups. The 12th year has seen a bit of a different format for the blog as we now have the newly launched Community sitting right beside us. I always tell people that the reason I started this blog and all the other side projects is to create more conversations about downtown Raleigh. Since readers were chiming in with their own reports and getting to know each other, why not create a platform just for that. There really is some good conversation over on the Community and I encourage readers to join us over there. 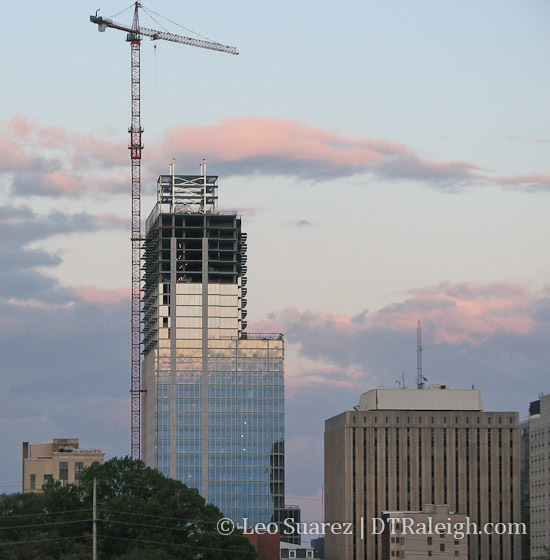 The blog will continue on with quick hit photos, project summaries, and a variety of opinion pieces on urban Raleigh. However, if you want to really dive in to the Raleigh weeds, check that one out. It’s also time for me to use this opportunity to remind folks that while passion runs these sites, there is always an opportunity for you to chip in. I run a lean setup here so dollars can make a difference in helping me out. Thanks to the many folks who have contributed so far. I appreciate th support. Today, we’ve made it to 11 years of downtown Raleigh conversations, writing, and photography. It’s hard to follow year 10 but I’ll still be treating myself to a drink today to celebrate this milestone. While I was working on an official definition of RalConography, I stumbled on this 2007 skyline photo that I wanted to share. From here, you can see PNC Plaza, then RBC Plaza, being built. 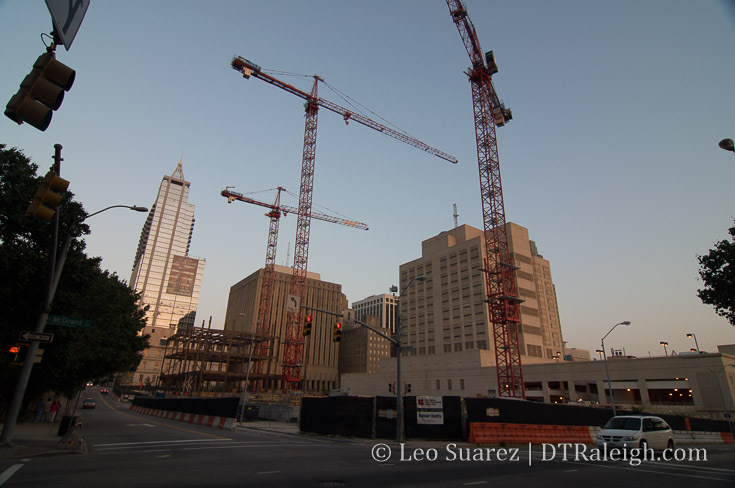 The Marriott hotel and Raleigh Convention Center are still under construction. The Boylan Wye is in shambles with overgrown shrubs and myriad scraps piled high. A number of residential and office projects have yet to be seen. That’s all changed of course and with 11 years of material the blog also takes on an archiving role which I’m enjoying very much. This also becomes my annual ask for reader donations. Rolled out last year quietly, I’ve been getting support from readers without even asking. I want to thank those that have contributed so far. I truly appreciate the support. Contributors will be my first contacts with any major updates I have coming in the future. If a Raleigh digital archive or Raleigh Development Wire service sounds interesting to you, please consider contributing and you’ll be in the know before anyone else. Thanks all for reading. Let’s keep this thing rolling. Ten years ago today, this blog, this side project, this hobby of mine, got started. 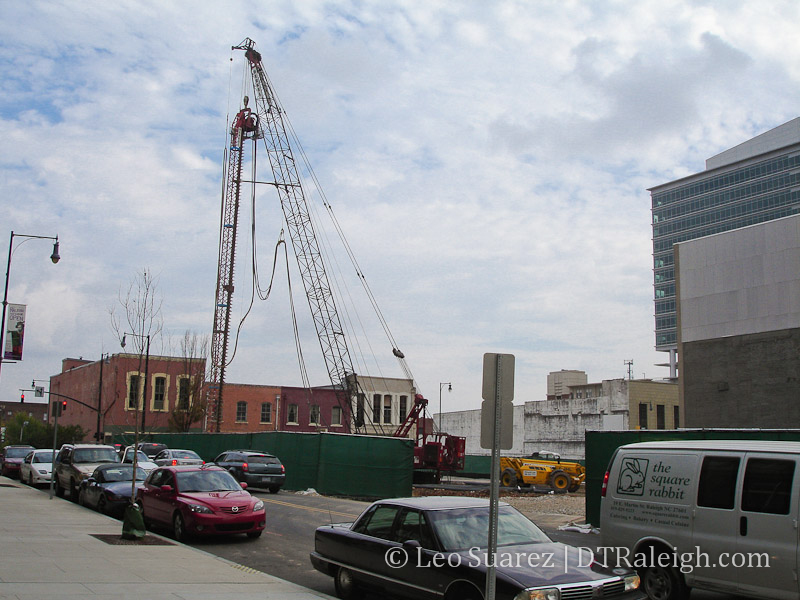 Today, there’s over 1100 posts written and photographed to what I think has become a decent archive of the change taking place in downtown Raleigh. This blog basically got its start after Fayetteville Street mall was converted back to a street for vehicles with the addition of wider sidewalks. The design we have today was reopened in the summer of 2006. That $10 million project was a major factor in kicking off new life for Raleigh’s core. Opening party for the new Fayetteville Street, July 29, 2006. See more at Raleigh Skyline. Towers were being proposed. Streets were being torn up. Explosives were being used. It was great. Later that year, I graduated from college, (NC State) landed an apartment on Fayetteville Street, and found myself with a lot more time on my hands. (no more homework) I wanted more data, details, maps, plans, anything to look at that involved downtown Raleigh. History was great but what was coming was better. There just wasn’t enough chatter out there so I decided to add my own take on it all through this blog. I don’t at all claim to be the first blog about downtown Raleigh. In 2007, there were plenty of blogs talking about downtown and changes coming to areas around Raleigh. Raleighing and RDUwtf were two that I visited frequently. The forums on UrbanPlanet.org, I was all over. Over time, the Raleigh online scene changed. I understand that some folks have to move on or want to do other things. 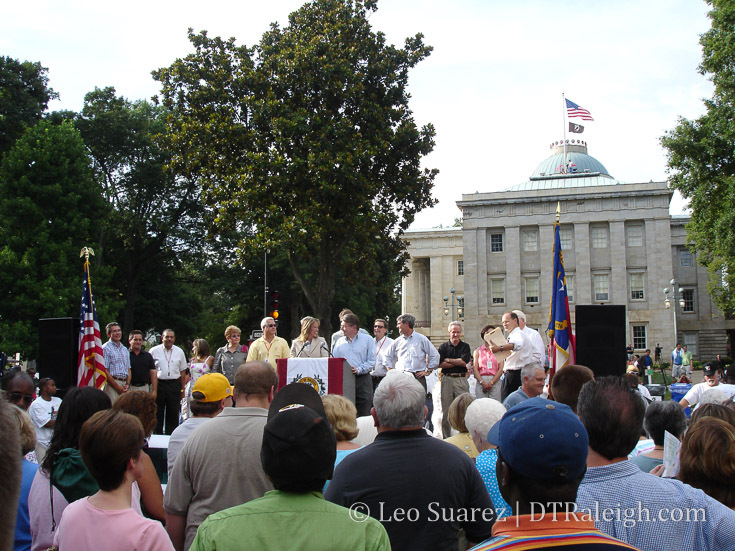 Today, you can catch glimpses, although a bit clumsily, of the online Raleigh blogs of the 2000s through the internet archive. I felt like I quietly created the Raleigh Connoisseur as a way for myself to document the changes. I had no expectations of where this would go or who would read it. I was just Joe Downtowner writing about what I saw. I’d like to take this time now to formally introduce myself. 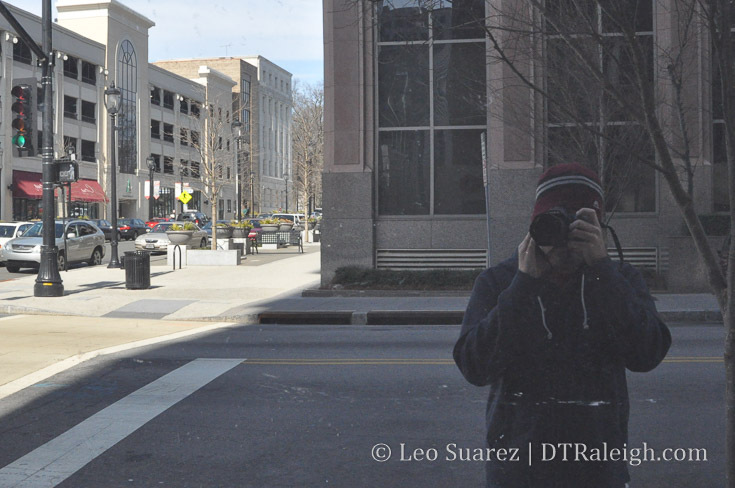 My name is Leo Suarez and I’ve lived in downtown Raleigh for 10 years. My family moved to Cary 20 years ago and we’re all on a path to keep sticking around for awhile. I studied electrical engineering at NC State, hated writing, and hated reading. After graduating, I quickly discovered that writing and reading weren’t that bad and that software is much more interesting than hardware. I don’t consider myself a millennial even if the marketing folks do. I always have a project that I’m working on, outside of work, as my way of ‘just helping out.’ Neighborhood groups, tech meetups, board meetings, and freelance work are just some of the things I’ve flown in and out of over the last ten years. This blog has become a lesson in web development, keeps the writing muscle strong, and motivates me to get outside and take photos. Once I had the rhythm down, posting regularly became easy. I couldn’t stop and I now get anxious if I go too long without posting. There really is so much to talk about that that has been a rarity over the last ten years. Starting out as single, the blog has watched me get married and have a child. (she’s almost two now) These days, I’m deep in the logistics-heavy portion of my life as I try to balance being an individual, a partner, and a parent. While life changes I’ve found one consistent theme that still exists, the thing to talk about here on The Raleigh Connoisseur; How is Raleigh doing on it’s path to becoming more urban? Whether I’m 23 or 33, there’s still a lifestyle that I strive for that consists of urban elements. The walks and bike rides I took when younger are still the same as today. My concerns for improving those experiences back then still exist today. My destinations may be changing but it’s this walk/bike lifestyle that hasn’t gone away with age. I’ll put money down that it will still exist for another ten years. Probably more. I’ve found that writing and covering new developments has been my go-to. Transit and transportation planning, parks, and parking are some of my other favorites. The underlying point, the thing I’m always thinking about, is how all of these things come together to create a walkable, urban environment where I can get to all these places on my own power. Am I looking for Raleigh to become urban New York or Chicago? Absolutely not. It’s unrealistic to think that Raleigh will ever look like these cities. Maybe New York and Chicago are too extreme of examples but the point is that when you look at the influences for growth in other cities that are considered urban, Raleigh’s story is quite different. One personal example of being urban in Raleigh is owning a single car for a small family. We’re not there yet but that’s the lifestyle goal we are trying to get to. Not only will it take some changes on our end but it will take some changes on how the city functions also. We’re optimistic that it is possible in this city. For this ten-year birthday post I wanted to put together some various thoughts or lessons that I’ve learned over the years. These are things I’ve come to realize about Raleigh and how cities generally work as they try to urbanize. 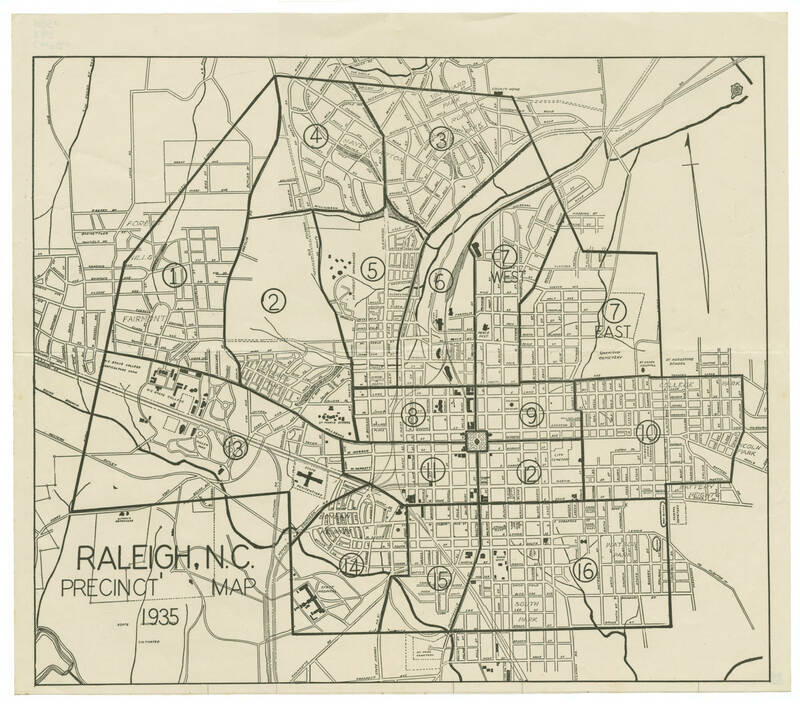 To understand where Raleigh is coming from on this journey towards becoming more urban and offering residents options to walk as part of their day-to-day, I realized that Raleigh’s history plays a large factor. For those that don’t know, Raleigh is a planned city. The original grid between West and East Streets, North and South Streets made up the original borders. With a few expansions later, the grid was maintained and push outwards. However, due to a number of influences that we won’t get into today, the grid was disbanded and future Raleigh annexations consisted of roads that did not conform to the grid. From my perspective, that point in history, the way your city was at that point in time, greatly determines how much “urban” you have to work with today. I really saw this when I was walking around Richmond, Virginia. Richmond isn’t a mega-urban city and it may not be considered urban at this point in time but it had good bones just like Raleigh. Unlike Raleigh, Richmond had a lot more bones than we did. 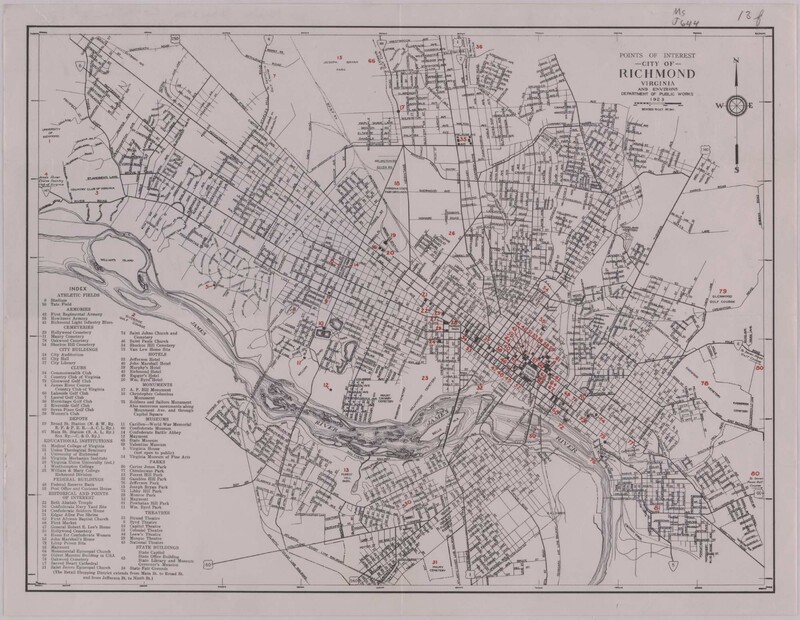 To show this, I found two historic maps, one of Raleigh in 1935 and one of Richmond in 1923. Twelve years apart, sure, but I think the point stands. As you can see, Raleigh was tiny compared to what it is today. The suburban build out added immensely to Raleigh, surrounding those good bones with suburban-style development. This all took place during the 1970s and later, during a time, one could argue, of greater prosperity than any time in our history. Raleigh’s greatest prosperity is probably going on right now, at a time when most residents are living a car-centered lifestyle. The city’s path towards becoming more urban is going to be different because we must retrofit decades of suburban style streets and developments. That could be a good thing because it left a lot of room for us to play with and bring in modern, urban amenities. On the other hand, retrofitting existing streets takes a lot of political will and buy-in from the public. This is a process that we may watch take baby steps as Raleigh continues to grow. Raleigh’s history and the time of when it hit it’s major growth spurt may force us to be urban in non-traditional ways. To make way for all this growth, this in-fill development, some old stuff needs to go to accommodate the new. I’m kind of amazed at how fragile buildings really are. It may not seem that way as we walk among these structures that define our environment but if you watch us demolish a building, there really isn’t much to it. It didn’t take long to demolish these buildings along Salisbury Street. Shown are the Garland Building, in front, and the Lawyer’s Building down the street. January 2009. I can’t quite find the right words for this but seeing 100-year-old buildings or houses destroyed and piled into a dumpster always gives me pause. A few years later, the new structure seems to be absorbed into the local culture and with so many people moving here the stories told by the former buildings start to fade. To be honest, I struggle to define my feelings on historic preservation. Should everything that is “old” be preserved? I say no because I think a sustainable city has high-value, high-functioning uses for its core. At the same time though, I believe historic buildings add character, add depth to the experience of the city. They add that unique element that no one else has. In an age where building plans and developers can create and build anywhere in the world, keeping what was built for Raleigh in Raleigh seems like the right thing to do. But the market is a powerful force and if no one wants to renovate a building and instead tear it down, should Raleigh interfere with that? To a degree, I think we should separate the experiences we had inside a building from the building itself. In some cases, old buildings are just that. Eventually, modern needs and safety reasons will call for a change. Restaurants, music halls, and shops can move. I believe the people behind that restaurant or shop have more to-do with the history than the building. 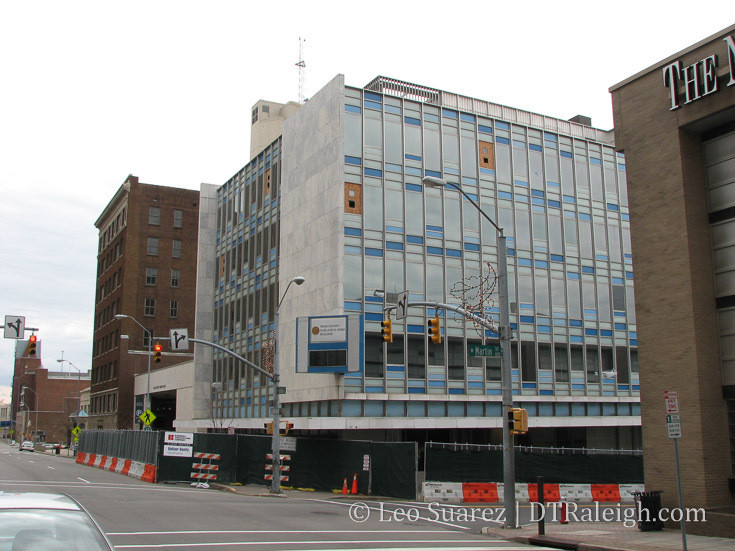 I do think that the downtown Raleigh resurgence over the last ten years has not been friendly to historic buildings. There are a few exceptions but I’m not seeing enough of an organized voice to save buildings of character. Perhaps a group of passionate local developers or help from the city is the answer . I don’t see that changing any time soon. You may be guilty of saying it also. I know I am. Then one day, instead of a new blank opening up, another Subway opens instead. What I’ve realized is that there are so many hands inside of downtown Raleigh. There are hundreds of property owners, hundreds of landlords, some living in and out of the city. Some are even out-of-state and out-of-touch with the needs of downtown Raleigh. That’s why a coordinated effort to have downtown consist of a mix of different services is more difficult than say at North Hills or Lafayette Village. At those locations, the variety of retail and restaurants are controlled. The advantage is that the one owner can keep things new and varied. In downtown, if you want to open another Subway, no one can stop you. That’s fine really, in my opinion, let’s not change that. I think there is a better way to look at this dynamic in downtown. In downtown, restaurants turn over a lot more than the shopping malls in the rest of the city. The best rise to the top and stick around resulting in a much better product. The less stable options may upset people but it makes for a more exciting food and shopping scene. It’ll probably take more effort to get something like this happening with retail but we may be in the beginning stages of just such a thing. The Downtown Raleigh Alliance uses their data and acts like advisers to those thinking of opening another Subway in downtown. They have the smarts to show that the sandwich market is hot during a weekday lunch hour but that there are also other types of food options that are missing. In the end it is up to the business owner to bring their concept and work with the downtown market. The downtown restaurant scene has definitely been raised over the last ten years. Which model do you prefer? One of the things I say when people ask me why I like Raleigh so much is that it is very easy to get involved. There are a plethora of opportunities to submit comments, ask questions, and just be a part of the civic process. What I found out very quickly is that very little people show up to public meetings. You may have a few hot topics each year that get larger groups to show but outside of that, public meetings only have dozens of participants. If that. There’s a good chance that your feedback, your comment, will be taken very seriously because you decided to show up and say something. I’ve found the city to be a very open office to work with. At first, it may take some getting used to, knowing who to contact depending on what situation. Their website isn’t perfection but it isn’t terrible either. Speaking up for something, for and against, goes a long way. I encourage more people to show up to public meetings. Related to my last point, I do want to reiterate the need for you to show up to a public meeting. I would love to see more people show up to public meetings and voice support FOR what they want, rather than against. Raleigh is accessible and open to all but it can’t be operating solely to keep the NIMBY crowd appeased. Opposition is called for when there is evidence that a proposed project will cause problems, destroy things worth preserving, prove unsustainable and ultimately fail. NIMBYism is not justifiable if the only question asked is: How will this proposal help me today? Future projects are not being planned for you personally. Rather they are for coming generations: for your children, grandchildren and great grandchildren. *Not in your back yard? Think twice before you demonize all change. With so much growth and change, it is presenting challenges for some residents. That is understandable. However, our city has adopted a long-range plan and for those that support it, we need to be showing up to meetings to offer support FOR projects rather than against. This city has, decades ago, decided that we will grow, not stay the same, or even shrink. I respectfully say to everyone reading that we need to accept that that is the near future and we can participate and guide this growth or watch on the sidelines. NIMBY resistance to new developments in our downtown makes for great reading in the media but those that want to see an expansion of urban elements in our downtown need to show up and support those that want to deliver them. Projects may not be perfect but I optimistically believe that working with developers and with the city on projects as a means to enhance, rather than being against, is the best solution. The problem is that it takes more effort. My simple solution right now is we need more folks supporting projects and speaking up when you see something you like. This one, I think, is easy. It’s convenient to look at plans for projects on a map, from 10,000 feet up. To really get a sense of how things work though, you have got to get out there and walk around the area. I’ll always remember one example of the ridiculousness of planning only with maps. In 2010, Raleigh was tasked with picking a route for a possible high-speed rail line to connect it with Richmond, VA. That project is probably in limbo right now but for more details, you can jump to this June 2010 article. In short, high-speed rail required all street crossings to be closed. Therefore, the railroad crossing at Jones Street, near Glenwood Avenue, would have to be closed to vehicle traffic. 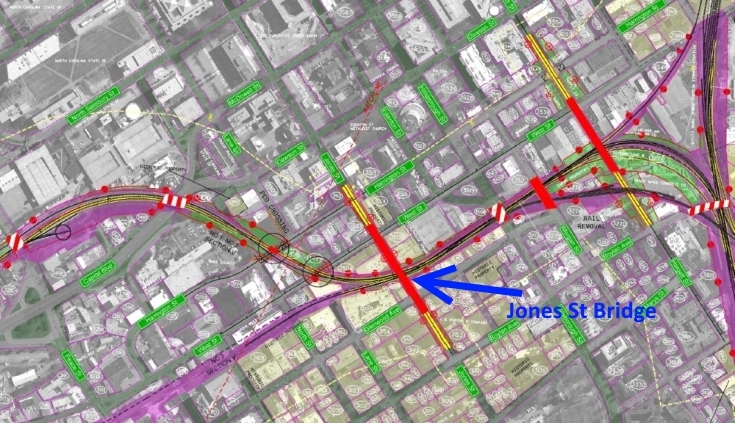 A bridge was proposed to raise Jones Street over the railroad. 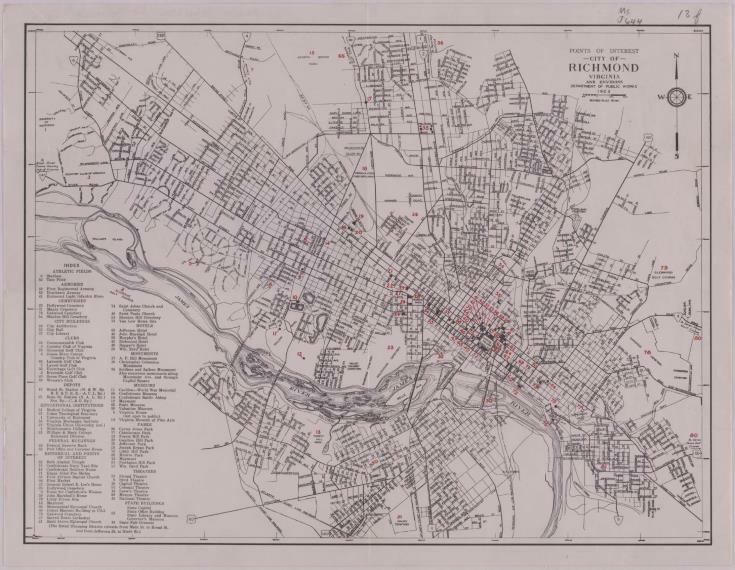 On a map, shown below, there was a bridge going over the tracks as well as Glenwood connecting to Boylan. I guess this makes sense when planning from your desk but you can see the nonsense of an idea like this if you walk that area. It doesn’t work. This is just one example, sure, and I have no idea if things like this happen behind the scenes or not. My lesson is that I must always go out to an area to see it with my own eyes to get a sense of the area first before I start playing with maps. My goal is to try and portray the area to RalCon readers through my camera and any other tools I may have. Maybe virtual reality is the answer but we must not only rely solely on maps. Get out there and walk the pavement! This pairs with my historic preservation thought earlier. What I have noticed happening in downtown Raleigh is that most of the new developments are really about taking multiple properties, combining them, and building a large-footprint, low-rise building. I’m not in construction but I’ve learned enough to know that there is a height limit when using wood and it is in the 5-7 story range, depending on how your ground floor slopes. After 7 stories, buildings must switch to steel and that sounds like a much more expensive building. These buildings will go taller and the footprint is usually smaller. My concern about the market delivering these large-footprint low-rises right now is how this behavior won’t solve the infill needs on the much smaller properties, mainly surface parking, in the core. I did a post awhile ago, I made a note to do an update soon, where I highlighted the most expensive parking lots in downtown Raleigh. One parking lot at the corner of Hargett and Wilmington, with a whopping six parking spaces, had a land value of $255,390. That’s $42,000 per space in 2010. Today, I checked back in, this piece of land is worth $722,411 meaning each space is $120,402. And they charge, I think, $10 to park there on weekends. Amazing right? Similar “pocket parking” lots like this are hard to develop and may continue to be the most expensive asphalt in the city. Unless of course a large-footprint, low-rise can be built on top of it. That means nearby, mostly historic, buildings will have to come down. The Raleigh Furniture Building in September, 2011. I don’t claim to know the answer here but how can we get the true infill that downtown needs, along streets like Hargett and Martin? We need new construction alongside the “ole girls” on the 200 block of East Hargett for example. 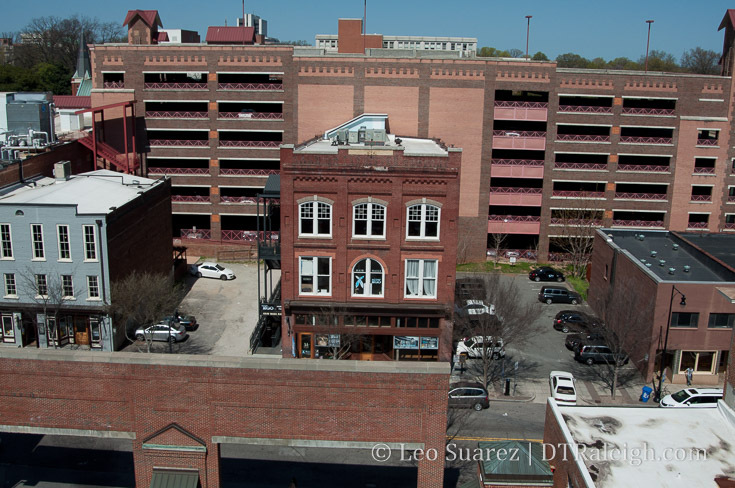 I love the Raleigh Furniture building but want to see new ones to the left and right of it. Will this pattern ever change? Pointing back to the desire for Raleigh to be a little bit more urban, I want more buildings along the sidewalks rather than stories in the air. In the beginning days of the blog, a stunning skyline was definitely something I wanted to see come together. Over time, I found it much more enjoyable to see things in front of me from the sidewalk, things that I could interact with directly. I’ve taken the blog from a “person-on-the-sidewalk” perspective to a “resident-on-the-sidewalk” perspective. Height doesn’t bother me but I always want to know what the ground floor uses will be as they will more directly impact what the downtown neighborhood and dynamic might become. As an example, our tallest buildings on Fayetteville Street include PNC Plaza, the Wells Fargo Tower, and Two Hannover Square. (BB&T) Wells Fargo and Two Hannover were built in the early 1990s and as a result of low interest in downtown Raleigh at the time, it is not surprising that their ground floor offers very little to the streetscape and the sidewalk. They have offices on the ground floor with bank lobbies so large they are only needed during the weekday work hours. PNC Plaza opened in the 2000s and was planned as a result of the new activity on Fayetteville Street. This tower includes multiple restaurants and windows that connect to the street rather than divide from it. I dream that one day the other towers may renovate their ground floors but a lot of other buildings along Fayetteville have the same affect. It’s a result of their time period which I understand when we talk about new buildings for today, the ground floor plays a big role for how you and I use the space. Visitors who come to downtown also interact with these spaces and they leave with some kind of lasting impression. That’s probably the most important element to changes taking place in downtown that I’ve grown to follow over the last ten years. I’ll take functioning, helpful, and memorable spaces along the sidewalks any day. Short and sweet, I’ve enjoyed reflecting on this post and I’ll revisit these points later as the blog continues to keep the mission consistent. See you at the next milestone. Today marks nine years of blogging here at ye olde blog. The most notable accomplishment in the last year was hitting 1,000 posts but nine straight years of keeping this thing moving has been pretty rewarding. For those that don’t know, this blog is a side project, a way to flex my writing muscle, play with my camera a bit, tinker with web development, and just get conversations going about our city’s urban core. This site is fueled by passion but also by those that participate by commenting and your emails. Thank you, readers for sticking with me. Above is a photo from the vault. 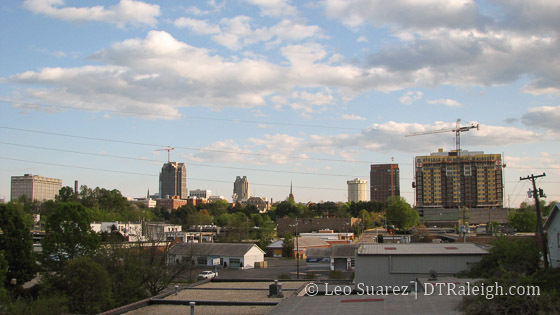 It’s a view of downtown Raleigh from West Street, north of Peace, taken in April, 2008. Just like downtown Raleigh, this website is never finished but always a work in progress. RalCon is now eight years old and there are a ton of good things to talk about and photograph this year. Downtown Raleigh in July, 2006. Lucky number seven? The blog has made it another year and maybe this time I will figure out something to do to celebrate it. A Raleigh beer perhaps? What I do like to do is use this time to dig into the photo vault and take something out. Sure we all like the real historic photos but it can be amazing to see the difference in just a few short years. Above is a shot from the Wilmington Station Deck looking south on a warm July day in 2006. What’s different? I’m thinking of throwing a party at number 10. Until then, we can plan for it and enjoy the downtown. Cheers! We’ve made it to six, SIX years of blogging. Let me get up and dance real quick……….. I really have no interesting story about how this website was started. I was bored at work one day and started blogging. It just stuck and here we are. What can you expect from this blog in the future? Absolutely nothing different. 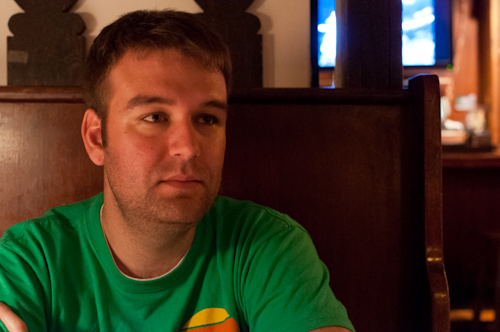 I plan to continue geeking out about downtown Raleigh, meeting new people, and taking photos. 2013 should be a good one as the Urban Design Center wants to start talks of a new downtown plan. Stay tuned for more as it comes out. As a birthday treat, I’d like to post this photo I took before the blog was started. 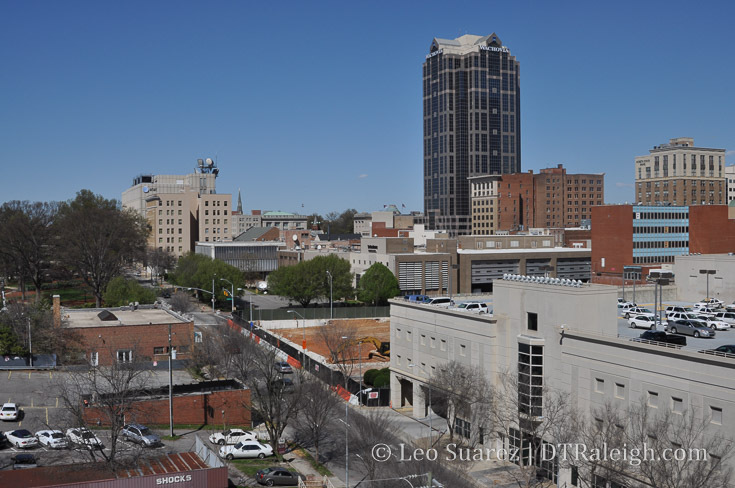 This is of the early construction work on the RBC Plaza tower, the current PNC Plaza on Fayetteville Street. Five years and going strong.